Looking for things to know before traveling to Banff? When I traveled to Banff in winter of 2018, I wish I would have known all these fun facts! Below you can find best time to go to see the ice castles, best places to stay, winter essentials, culture differences, what to eat, and currency tips. Don’t forget to check out my 5 Day Itinerary to Banff in the winter to learn the ONLY dog sledding company in Banff National Park, Best time to take the gondola up to Sulphur Mountain, Ice Skating spots, & more! If you want to experience Banff as a winter wonderland, go in January! Lake Louise has its famous ice castle festivals and ice bars. All of the lakes are frozen over and there’s plenty of snow for skiing and dog sledding. If you want to experience the warm weather and turquoise waters, go in late spring. I asked all the locals this question and they said summer’s are way too crowded and a lot of forest fires from British Columbia make the air quality bad during June – August. The Fairmont Chateau Lake Louise is an experience in and of itself. In the winter months, this 5 star, luxury hotel is comparable to other hotels in the area. I would say the only downside to this hotel is it is far from restaurants and shops. The actual city of Banff is located about 40 minutes from Lake Louise. However, this hotel has it all! Seriously… They have 7 restaurants, 2 bars, 1 wine bar, full service spa, hot tub, fitness center, and an entire mall in the hotel! You never need to leave this winter wonderland castle! In the summer months, the Fairmont is extremely expensive. If you’re looking for the luxurious experience, this will definitely be the hotel for you. Keep in mind, if you plan to do a lot of hiking in the summertime, it will be a far drive from many hikes. I would personally recommend staying at a hotel closer to the actual city of Banff. This way you can do hikes like Johnston’s canyon and Lake Moraine without having to drive too far, making your overall vacation more enjoyable. Some great options closer to Banff are Juniper Hotel, RimRock Resort, or Fairmont Banff Springs. Multiple Beanies to keep your head and ears warm. I would stick to neutral beanies with colorful clothes or neutral clothes with a colorful beanie. This one comes in packs of two and every color you could ever want! Gloves! If your hands aren’t warm, you won’t be warm. It’s as simple as that. I would recommend getting tech-finger gloves, so you don’t have to take them off when you want to use your maps or take a picture. This one comes in a pack of three so you have color options. Hot Hands Hand Warmers are my holy grail for any winter destination! They seriously make the world of a difference. You can stock up with large pack for so cheap on Amazon! I even use these things in Las Vegas in the winter (yes, I am that much of a baby). Wool Socks because like your hands, if your feet aren’t warm you will not be warm! This pack comes in all the neutral colors and.. aren’t ugly. Which is always a major plus, ha! Thermal under layers are not the cutest thing in the world, but if you are wearing jeans, a sweater and a big coat over… no one will notice! On the bottom, I wore these with an extra pair of leggings and jeans on top. On the top, I would wear a thick sweater and coat on top. Everyone really does say “ay” AFTER. EVERYTHING. At all restaurants, they have small credit card readers that they bring to the table when you are ready to pay. They never take your credit card out of your site, which is much safer but extremely awkward because you are forced to calculate the tip in front of the server! Everyone is obsessed with Celine Dion. I’m not sure if it was because I said I was from Las Vegas (where she performs regularly), but it was a conversation starter everywhere I went. Poutine fries are the #1 thing you MUST TRY in Canada. It’s a big plate of fries covered in gravy with cheese curds sprinkled on top. Most portions are easily shared between a group, or you can have it all to yourself. Hey, calories don’t count on vacation right?! Beaver tail is a pastry in the shape of a beaver tail that has toppings on it. You can add bananas, chocolate, caramel, Oreo cookie… the world is your oyster! A must try whenever it’s cold! Gruyere cheese is extremely popular in Canada. They put it on sandwiches, burgers, omelettes, and fondue! You will find maple syrup in every single store. This is what Canada is most known for and produces 71% of the worlds maple syrup! They take the Canadian dollar. A lot of places will still accept U.S. dollars and a lot of U.S. credit card companies (i.g. Discover and American Express). Of course though, don’t rely on only U.S. currency and credit cards because there will always be smaller shops that don’t accept it. For American’s, the Canadian dollar is in our favor. Whatever it is listed in Canadian dollars, you can typically take about 30% off that. That is constantly changing though, so make sure you check to see right before you go. PSSST… Want more on Banff in the winter? 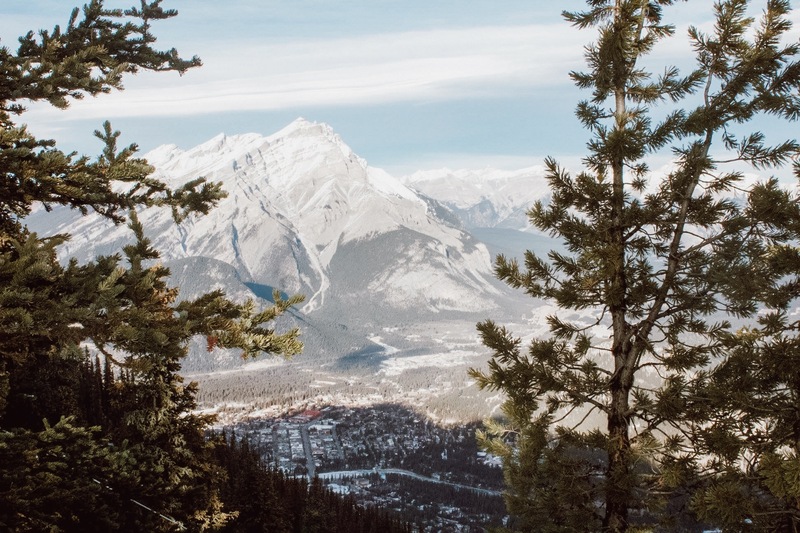 Don’t forget to check out my 5 Day Itinerary to Banff in the Winter!